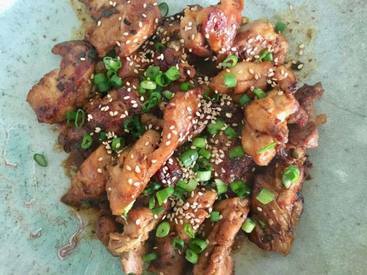 Marinated, then stir-fried, chicken bulgogi is a simple dish that combines classic Korean sweet and salty flavors. We often use it as a topping for a vibrant bibimbap-inspired “mixed rice” bowl. It’s a favorite with both our families. For a simple, everyday bibimbap, just top hot short-grain rice with the bulgogi chicken, kimchi and few fresh or cooked vegetables — add a fried egg, too! Serve it with some gochujang, a Korean chile paste, on the side.